Privileged location ! close to Sosua center. 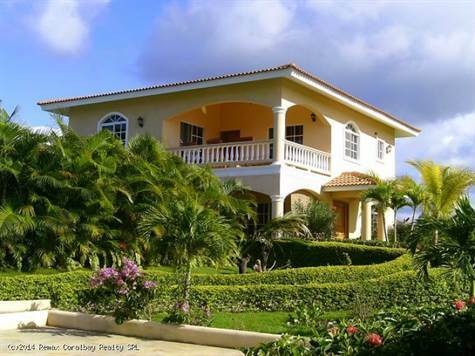 This beautiful gated community is within walking distance to Sosua beach, restaurants and activities. This recently finished villa has taken advantage of its position in a very optimal way for the best benefit. On the main floor it offers living and dining room, very well selected oak kitchen with stainless steel appliances, guest bedrooms which can be used as an office, visitors bathroom and terrace with large pool area... The first floor offers two large bedrooms and bathrooms with walk-in closets. From the balcony, you will enjoy the spectacular ocean view ! the swimming pool is settled in a tropical garden with many different fruit trees like avocados and bananas and beautiful manicured flowers... This villa offers excellent privacy, perfect for large family or vacation rentals. From the house you reach the International Airport of Puerto Plata in only 10 minutes drive. This gated community offers a security service as well as water and electricity around the clock, on-site management and rental service.